Among the hardened warriors and alien conquerors inhabiting the Dreamlands, Anarki sticks out like a sore thumb. It’s tough to keep up with the transhuman punk when he’s blazing trails around the Arena on his hoverboard, but his speed is just one of the things that allow him to stand on the same level as Champions like Nyx and Scalebearer. Anarki is one of the Champions you’ll be able to try out during the upcoming Closed Beta, which will begin on Thursday, April 6 with an initial group of testers. More players will be added into the Closed Beta over time, so make sure to sign up now. You can see Anarki in action in our latest profile trailer. It’s a tale as old as time. Boy gets addicted to surgery. Boy begins to perceive a surreal dream world. Boy meets girl. Maybe that’s not the standard romantic tale, but it’s Anarki’s story. After spending much of his rebellious youth in a haze of self-vandalism, Anarki discovered the joys of cybernetic surgery. His fixation on transhumanism took hold, and piece-by-piece he changed himself, believing life would be better if he could just be less human. Why tolerate human weaknesses if he could replace everything dragging him down? The surgeries continued and grew more and more extreme, until one surgery pierced his pineal gland, opening his mind to a strange alien reality he had never seen before. Anarki chased this reality like a new high and sought out more dangerous procedures, each of which strengthened his ability to perceive this other realm. That’s when he met a girl who could see this place, too. Together, they were sure they could reach it, and for better or worse, they eventually did. The pair found themselves in the Dreamlands, where Champions from the waking realm are forced to battle each other for eternity in twisted and ancient Arenas. Anarki is a firm believer in performance enhancement – anything that will give him an edge over his opponents. Should you find yourself running low on health, you can trigger Anarki’s active ability to get you back in the game. Every time you use Anarki’s Health Injection ability, you add a little more to your max health. Anarki will retain this boost ever after death. 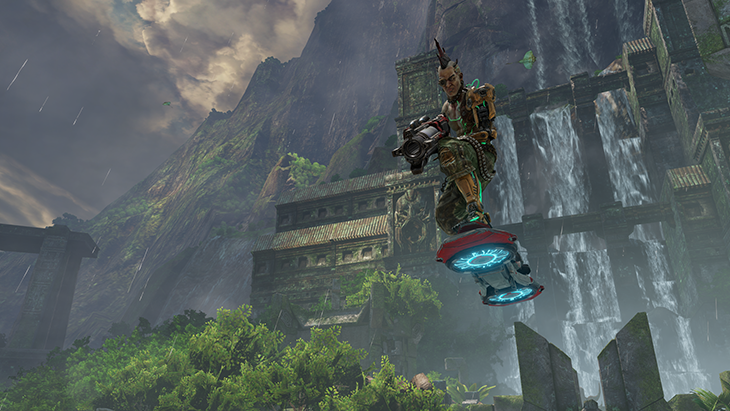 Thanks to his Hoverboard Air Control passive ability, Anarki actually gains more speed than the other Champions as he strafe-jumps around the Arena, turning him from a speed demon into a speed God. This passive ability also gives you more control over his movement, allowing you turn sharply mid-air and rapidly change direction. Sign up for the Closed Beta now and try your hand with everyone’s favorite transhuman punk, Anarki. Keep an eye out in the coming weeks for more Champion profiles, map features and game mode breakdowns.